Well, it happened. I’m 50 years old. Unfortunately, I never found the suit, so instead, to celebrate my birthday I present a list of 50 Things I’m Grateful For. They are in no particular order. That Dan has stuck around this long. Kiehl’s Lip Balm No. 01 in the pot. Aidan…a remarkable creature. I’m so grateful to be her mother. That I figured out the short hair thing early in life. Stevie (my Subaru Forester). I know I won’t technically own her for another 4 years and 10 months, but she still makes me smile every time I walk into my garage. Having a home that I can afford to live in. Apple technology of all manner. What I get to do to make a living. Ideas for making stuff that sometimes seem to come out of nowhere. That most days, nothing requires me to wear a bra. That I get to watch Cole play ultimate and music, though not necessarily at the same time. Ali. You are the shizz and I love you. Any appetizer that uses goat cheese. The fact that the Earth moves around the Sun in such a way as to create Fall and Spring. The opportunity to make changes in my life for the better. That Aidan is having a fantastic sophomore year of college. My well worn Merrell shoes that look hideous but feel heavenly on my feet. Whatever the remaining decades are called. Amy. You are also the shizz and I also love you. The fact that I can walk into a room and have water that comes out of a tap that is safe to drink. Margie, who I don’t see nearly enough but I adore her. Oh my God, I almost forgot Tim and Mark. They both make me smile on a regular basis. That I keep getting to wake up every day. This life. All of it. Now if you’ll excuse me, I’m off to do whatever the hell I feel like doing, within reason. Glad to hear you are willing to tell your age. I am as well (I have 12 years on you in one week), as I feel the alternative is not so good. Happy Birthday and Congratulations! Happy birthday, Cathy Z!! I wish we were neighbors because you are awesome!! Happy birthday. It just keeps getting better. Enjoy. Go for it, Cathy! Have a great day!!!!Happy! Happy!!! Happy!!!! Happy Birthday Cathy! I turn 50 in 10 days. We are like fine wine, get better with age. Love your list, awesome idea. Enjoy your day! Happy Birthday Cathy! I hope your special day is as wonderful as you are. You are honest and real…love that about you. Enjoy your day! Happy, Happy Birthday CZ! Have a wonderful day! Have an awesome day Cathy! Happy Birthday!! I hope you have a fabulous day!! (And I would have guessed maybe 40-something if someone had asked.) Embrace the age and own it!!! Happy Birthday! I love the sign and the wine, in the alley. 🙂 Isn’t this unseasonably warm MN weather great? Happy Birthday, Cathy! I have loved reading your blog for that last few years and I just think you are the the coolest! I hope you have a beautiful Day!! Happy 50th Cathy! Enjoy your special day! Happy Birthday – here is a goat cheese appetizer that is amazing! Process first 5 ingredients in a food processor until smooth, stopping to scrape down sides. Spoon cheese mixture into a lightly greased 1 1/2-cup mold lined with plastic wrap. Cover and chill 2 hours. Invert chilled cheese mixture onto a serving dish; discard plastic wrap. Spoon fig preserves over cheese. Garnish, if desired. Serve with crackers, toasted French bread slices, or bagel chips. YUM! Adding that to my list. Also forgot to mention – I don’t use a food processor…I just stir it all up together really well and roll it into a tight log in plastic wrap and chill. So much easier than the way listed. Enjoy! love me a little bit of joe jackson! thank you for that. and, happy birthday to you! Happy Birthday!!! You make 50 look amazing! Happy Birthday Cathy! Love your list. Hope your day is filled with mischief, laughter and love. Happy 50th Cathy! I turned 40 late last year and you are great role model for where I want to be in 10 years. You are comfortable in your own skin and I love that about you. Enjoy this day and I hope you can make it a special one. Happy Birthday Cathy – you would make my top 50! Happy 50th Cathy! I just turned 50 in September and life is good. Can’t complain and think I might have to scrap a page on 50 things I’m grateful for. Great idea!! Hope you have a wonderful day — you deserve to do whatever you want. Happy Birthday!!! Cheers to you and me (45 this past Sunday) and to hoping I look half as awesome as you at 50! Happy Birthday!! We are all blessed that you are on the Earth. Fantastic list! Hope you have a wonderful day and an even better 50th year! Happy 50th Birthday, Cathy! I love your grateful list. What’s even better is the photo at the very top. Looking good for 50! May you have a wonderful coming year! Happy Birthday Cathy! Since it’s your 50th birthday, you get to celebrate for 50 days! Happy Birthday to an amazing, inspiring and funny young 50 year old. Been there, done that and I have never minded telling anyone my age( 63 on the 22nd). I loved my 50th year as we celebrated our 30th wedding anniversary, our daughter married a wonderful man and happy that menopause was finally done! I’m so glad that my daughter introduced me to you many years ago through the Internet. Love your list and enjoy every day. Welcome to the 50’s Cathy!! Happy, happy birthday Cathy! Hope you have a fantastically awesome day! ??? Happy 50th Cathy! I hope that your day is fabulous (just like you). Love the idea of this list. Enjoy! 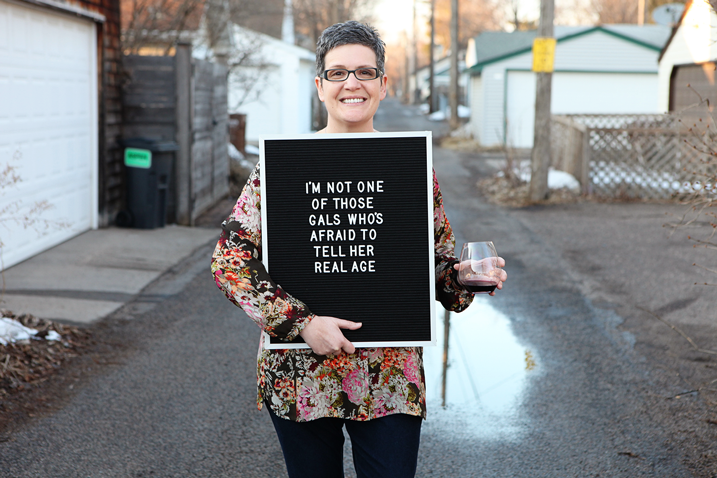 Life begins at 40 – nah, it’s 50 – go out and enjoy it Cathy!! Happy 50th Birthday Cathy! You are definitely on my 50 list and I couldn’t imagine doing what I do with my kids, scrapbooking, my friends and my life generally without your design, your honesty and for real-ness, and your unbeknownst to you influence you have had on me these past 11 years I have followed you. You rock! Hope you have had the best day. 63 this month – I am so doing a list this year! Thanks for that. Happy Birthday Cathy – old friend. LOL My husband asked me if I actually knew you the other day – apparently I have retold your stories um….often and he was puzzled how I could feel like I knew you when we had never met. The magic of blogging I suppose. Funny thing is when he asked me, I had to stop and think whether I had met you at some convention or another….nope don’t think so. But thank you for making me laugh almost every day. Glad to be on this funny journey with you adding your spice. I will have some wine and goldfish in your honor!!! Happy birthday! Love your positive attitude and that fabulous list. I will be 50 in 6 months and this is the first time I am dreading it. Not sure why but after reading this positive post, I need to change my attitude. Happy birthday my interweb friend! May today be the end of a glorious 1/2 century and the start of another rockin’-rollin’-hang-on-to-your-hats 1/2 century of awesome life! Me, in my Merrell’s, salute you at 50! HB2U! Happy Birthday !!! And I love your list. You always make me smile. GAH! If only I’d known! I could have made you a jumpsuit! Happiest of birthdays, Cathy! There is absolutely no shame in growing old. It is a privilege denied to many. Happy Birthday Cathy! I hope this year brings more of all the things you love!!! Happy birthday! Also, I’m dying for one of those signs, where did you get it? Thank you! Keep on being awesome! HAPPY BIRTHDAY Cathy!! I Love your list! We are in good company because I just turned 45 a few days ago, and I too am not a gal who is afraid to tell my age. It has never bothered me- it is what it is! And I too wrote about my arrival at being 45 so I thought I’d share it with you. I hope you can appreciate it. Its a little different, but a reflection nonetheless. However, I will remember to make my own gratitude list when I arrive at 50. Such a great idea! Happy Birthday Cathy! Lookin’ mighty slim these days! Here’s to the next 50! O Happy Day! I’m hitting 50 on Saturday and I’m right with you, let’s rock 50! Enjoy! Just so you know – I turned 55 on 3/1 – good head space makes it painless. Happy Birthday Friend! Keep on trucking and making me laugh! I remember 50. I turned 60 last month. So when you’re my age, I’ll be 70. (I’m grateful for math. And grammar.) Let’s enjoy our next decades, Cathy! Salut! Happy Birthday, Cathy! You have a month and a day on me. Thanks for the inspiration on how to celebrate! Happy Happy Birthday Cathy! You continue to inspire me. Happy, happy, happy B-day! Come to DC someday and I’ll make you a cake to celebrate. Happy Birthday Miss Cathy! Hope your day was grand. Awesome. I just turned 40, and I always thought people who were bothered by their age were being silly. Now, I understand. My husband just turned 40 also (we’re 2 weeks apart), and he’s embracing it by growing a beard, dressing more dapper (dapperly? ), and learning to whittle. Isn’t there an old saying… something like, “Men get character; women get wrinkles.” Sigh… ANYWAY… You are awesome. #38 cracked me up. Seriously, what ARE they called? #46 made me smile because I pictured you on stage with your Oscar trying to get all your thank-yous in as the orchestra was pressuring you off stage. 🙂 Fun. HAPPY BIRTHDAY!! Happy 50! I hope you have a wonderful day. You always make me laugh! Happy belated – my list would include gratitude for overtime pay, but then again work takes up so much time I miss giving timely birthday wishes. Excellent list! I hope you have a great day and a great year of wonderful 50-ness! Happy 50th Birthday, Cathy! I’m not far behind you. Loved your list. Would absolutely love to have seen you in that red jumpsuit. But you can punch and kick and punch anyway. Thank you for sharing your life with us online. Happy birthday! 50 is just another beginning of a new chapter and the fun begins! I looked up shizz, I guess it’s slang. Since you applied it to your friends it must be good. I got to do a list! #22 made me giggle. I wish I could do that daily but I don’t think it fits into the dress code for a law firm. Damn! Happy Birthday! I love the list, but the red jumpsuit would have been hilarious! Enjoy your day. The 50’s are fabulous, so relax and enjoy them. Happy Birthday. HAPPY HAPPY BIRTHDAY Cathy from Melbourne, Australia!! What a great list! Just wanted to share something with you – when I turned 50 3yrs ago I celebrated it by doing “50 Ways to Celebrate my 50th” over the whole year! I didn’t want a party where you hardly get time to chat to everyone – instead I had several small intimate lunches and dinners with the special people in my life. And then I did a skydive, climbed the Sydney Harbour Bridge, walked with a tiger for an hour around DreamWorld, got gel nails, did a hot air balloon flight, saw Barry Gibb in concert….you get the idea! Mark of "Tim and Mark"
Wait, Why is Tim listed first? Alphabetical by last name? Is it based on geography? Happy Bday Cathy!!! I would love to see you recreate that video!!! It would be a crack up! Cheers to many more!